Drum Note Lengths and Names - Beginner Drums guide! When learning to play the drums it’s important to understand different drum note lengths and what those notes are called. Every country has it’s own name for different note lengths but in English speaking countries there are two main systems used – the US system (quarter note, eighth notes etc.) and the UK system (crotchet, quaver etc.). The US system is rapidly evolving as the international standard for note naming on the drum kit, however it’s very useful to know both. US terminology refers to Quarter Notes, Eighth Notes, Sixteenth Notes etc. In the UK note lengths are still commonly referred to as Crotchets, Quavers, Semiquavers etc. This terminology is used extensively in classical music. Quarter notes are really your most basic note type. They dictate the ‘beat’ in most pieces of music. When you count to four over a tune, 1, 2, 3, 4, you’re probably counting in quarter notes. There are 4 quarter note ‘beats’ in a bar of music played in the 4/4 time signature. 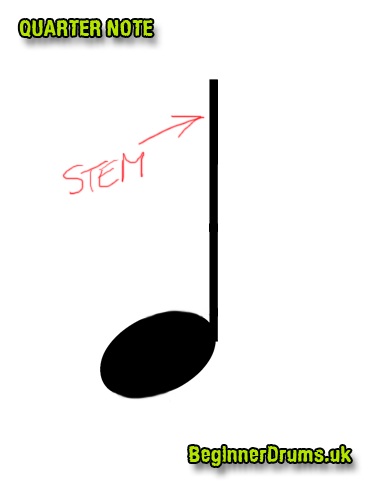 A quarter note is shaded black and has a stem with no flags on the stem. What is an eighth note? Eighth notes are twice as fast as quarter notes. So you can fit 8 eighth notes in the space of 4 quarter notes. You count eighth notes by saying “1 and 2 and 3 and 4 and”. 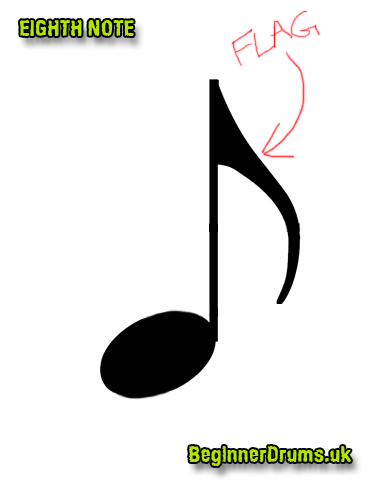 An eighth note looks exactly the same as a quarter note only it has a little flag attached to the stem. When you have two or more eighth notes together you join them together with a beam instead of a flag. Generally speaking, whether it has a beam or a flag is irrelevant and it’s just to make things look pretty. Beams are normally only used in note groupings of 2 or 4 notes… normally. Don’t worry about it. If it has one flag it’s an eighth note. If it has one beam it’s an eighth note. As well as knowing when to play, you also need to know when NOT to play. This is shown with a ‘rest’ on the music and you can see the symbols used for this in the notation guides above. When you’re just starting out on drums it’s sometimes easier to say the word ‘rest’ when you come to a rest. You’ll very rarely see half notes or anything longer in drum music. 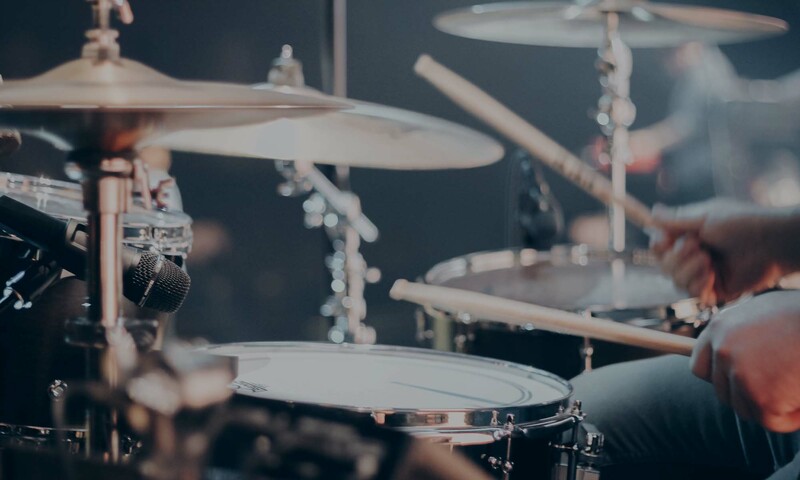 Since drum notes don’t have any length there’s really very little need for them – when you hit a drum it sounds the same regardless of whether it’s a long note or a short note. Unlike a piano where if you hold your finger down on a key you’ll play a long note whereas if you quickly take your finger off a key you’ll have a short note. Having said that you WILL often see half note and whole note rests, so it’s a good idea to see what they look like on the above chart. Those are faster notes and we’ll come to those later on as we get a bit more advanced on the drums. Don’t worry about them for now. On this sheet we’re looking at how to count different note lengths, from whole notes right through to sixteenth notes. When you first start playing it can be helpful to count out loud while playing. Notes such as eighth notes and sixteenth notes can be grouped together to make them easier to read – on this sheet we’re looking at different common note groupings and what they look like when different note lengths are mixed together. Here’s your reference sheet for note names, values and their corresponding rests. 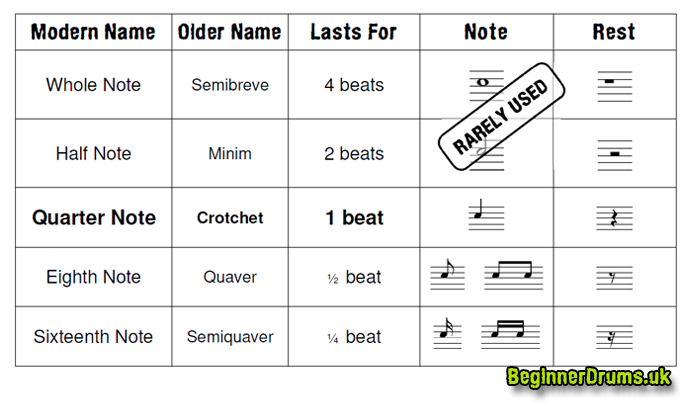 The chart is helpful to show how long each note lasts relative to one (quarter note) beat. The whole notes and half notes are shown as ‘rarely used’ since these are rarely encountered at beginner level. This is a more advanced version of the above and includes extra elements that are encountered as you progress on the drums. We also introduce dotted notes. A doted note is the length of the original note + 50%. A double doted note (not shown on this sheet) is the length of the original note + 50% + 25%. You’ll rarely see these at beginner level so don’t stress. But just so you understand, a double dotted quarter note is the equivalent note length of a quarter note, eighth note and sixteenth note glued (tied) together. As I say, don’t worry about this but it’s handy to know how the whole system works.